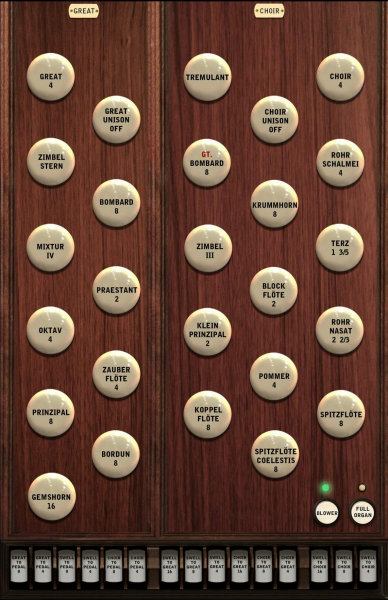 The Aeolian-Skinner pipe organ, opus 1301 was manufactured in 1956-1957, when the company tonal director was Joseph S. Whiteford who was the successor of the deceased G. Donald Harrison. 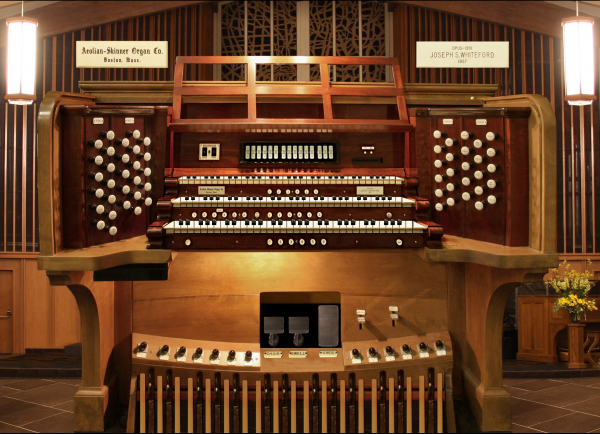 The organ is still rooted in the Harrison's "American Classic" style, although Opus 1301 bears witness to the tonal philosophy of Harrison's later interests, when he experimented with modern versions of old German solo reeds (Krummhorn, Fagott, Rohr-Schalmei) and moved somewhat towards the (neo-)baroque design (principal choruses crowned with mixtures on all manuals, unenclosed pipework). Joseph S. Whiteford's tonal principles were similar to the late Harrison visions, perhaps putting even more emphasis on the baroque organbuilding principles (unnicked flues with expressive articulation, lower wind pressures, intense reeds). 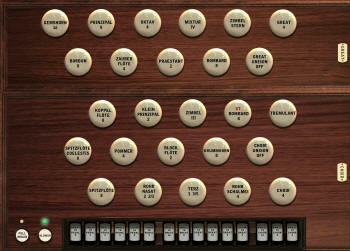 The Opus 1301 is a rather universal instrument, upon which many schools of organ compositions will sound clear and plausible. 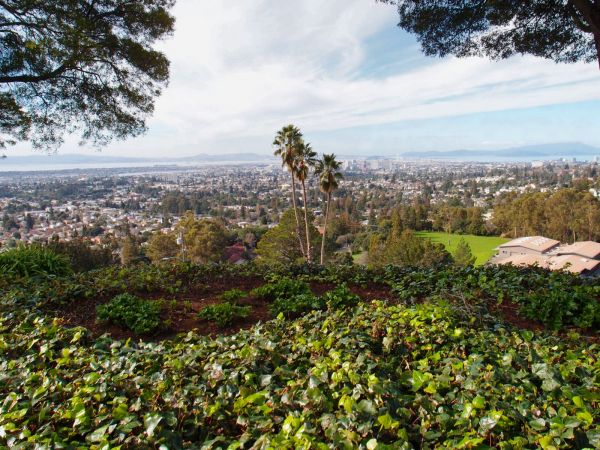 Aeolian-Skinner organs are famous for the delicate and even voicing, decisive speech, and good blending of choruses, allowing clarity in polyphonic textures as well as graceful (even sublime) solo melodic lines. 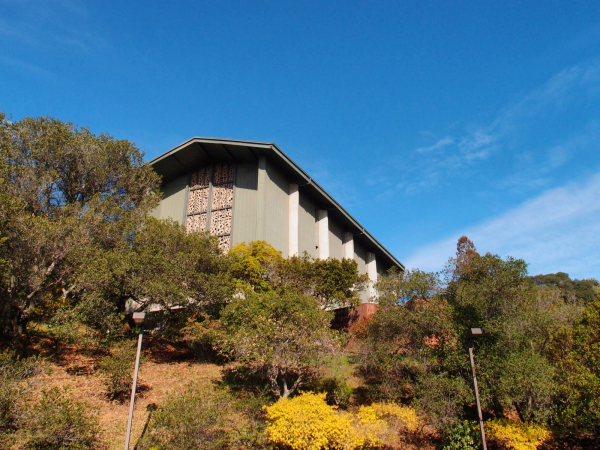 It was built for St. John's Presbyterian Church in Berkeley, later sold and moved to the First Covenant Church, Oakland, California. 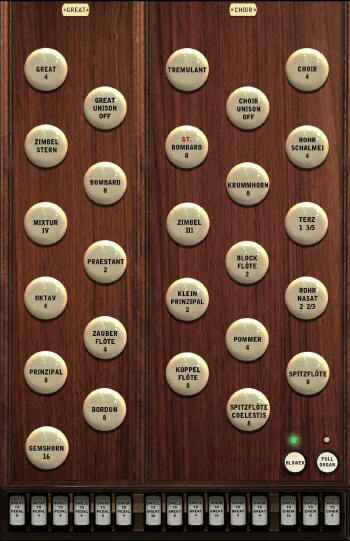 After the transfer, the organ was reassembled and overhault by Schoenstein & Co. organbuilders in 1983. On that occasion, adjustments were made to the tonal layout, some stops were revoiced, several stops were cleverly added, emphasizing the traditional "Werkprinzip" and individuality of each division in the design. 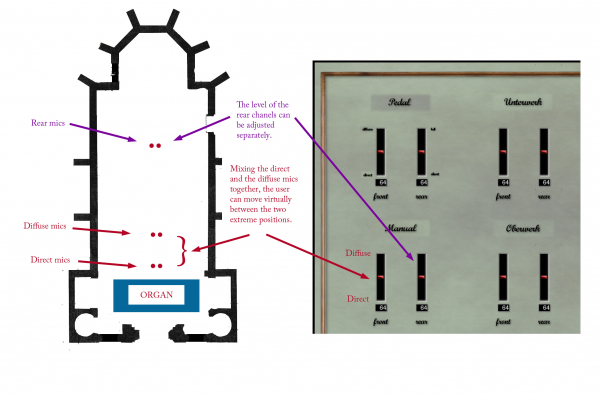 The organ is split into two chambers at the front of the room, there are no visible pipes. The stop and key action is electric. It has 3 manuals (Choir, Great, Swell) and a pedal. Alltogether 45 speaking stops. The pedal has 13 souding stops of which 6 are borrowings from manuals. Swell has 12 sounding stops, enclosed. 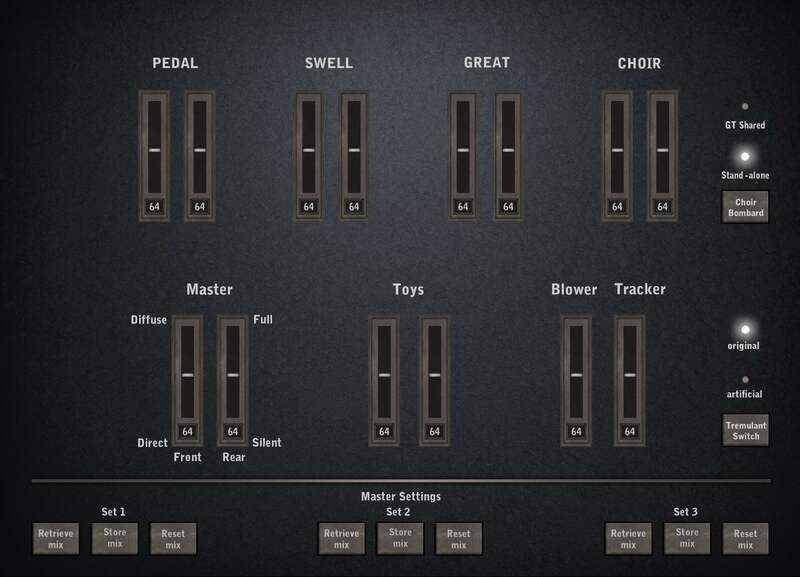 Great offers 8 sounding stops. 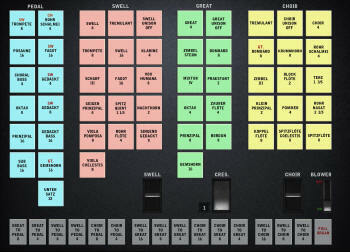 Choir has 12 sounding stops, enclosed. Numerous straight, octave and sub-octave couplers available. 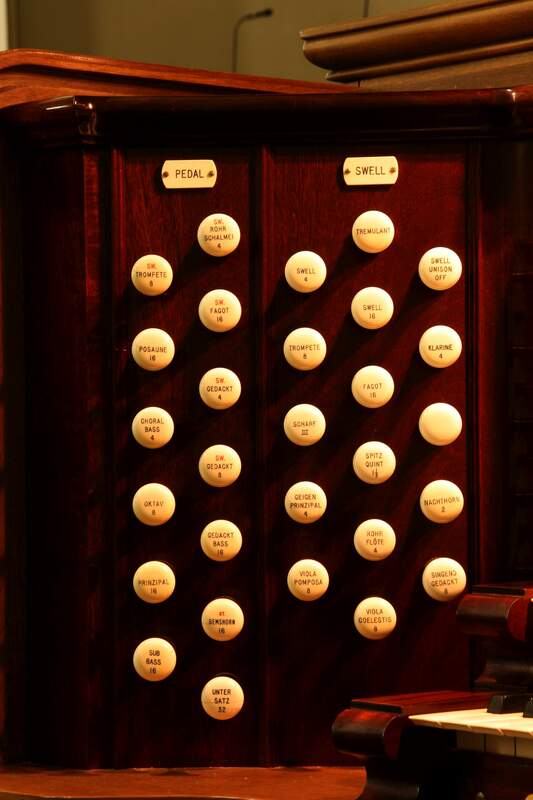 Many stops of the Choir and Swell divisions have inner extensions (the upper 6th octave) for the use of the super-octave couplers. Swell and Choir divisions have tremulants, all stops were recorded twice, with the tremulant enganged and disengaged. Thus, authentic tremmed ranks are available in the Hauptwerk model of the instrument. Crescendo pedal available. 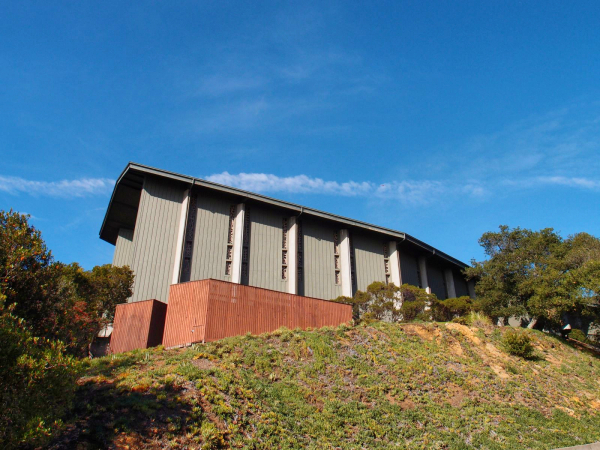 Special thanks to the staff of the First Covenant Church, who were maximally helpful and enthusiastically welcoming the Sonus Paradisi team for recording their instrument. The Organ. An Encyclopedia. Second Edition, (D. E. Bush - R. Kassel, eds. ), 2015. The samples are offered in 48kHz/24bit resolution. The multiple releases have three levels: short, mid and long. Hauptwerk v4.2 and higher supported. The sample set is encrypted, which means that it can be used with Hauptwerk Basic or Hauptwerk Advanced versions exclusively. Hauptwerk Advanced version is strongly recommended, the Basic version is not suitable to run the Surround variant of the sample set (memory limitations, audio channels limitations). There is no use of the sample set possible in any other software. The original compass of the keyboards is 61 keys (full 5 octaves). Many stops of Choir and Swell divisions have inner extensions (top 6th octave, up to g4) for the use of the super-octave couplers. The original compass of the pedal division is 32 keys. All ranks of the Choir and Swell divisions were recorded with and without tremulants for the most convincing tremulant behavior. However, loading the authentic tremmed ranks consumes large amount of RAM. It is possible to select to use the artificial tremulant instead to save RAM (the switch is located on the mixer tab). 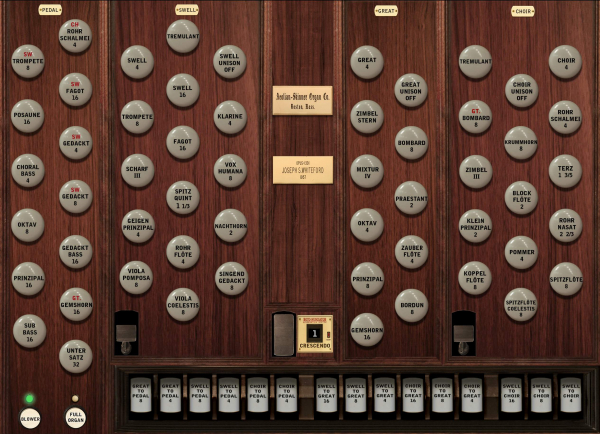 Polyphony of 6000 voices recommended for the full suround (3000 pipes minimum). 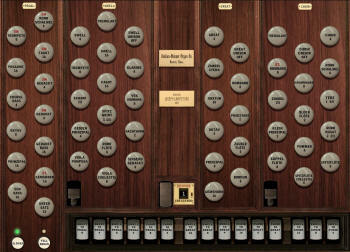 Polyphony of 1800 simultaneous pipes recommended for use of the wet sample set. Stops denoted by an asterix * were added by Schoenstein in 1983. ** The Choir Bombard is originally shared with the Great. For the sample set, another Choir Bombard is available. 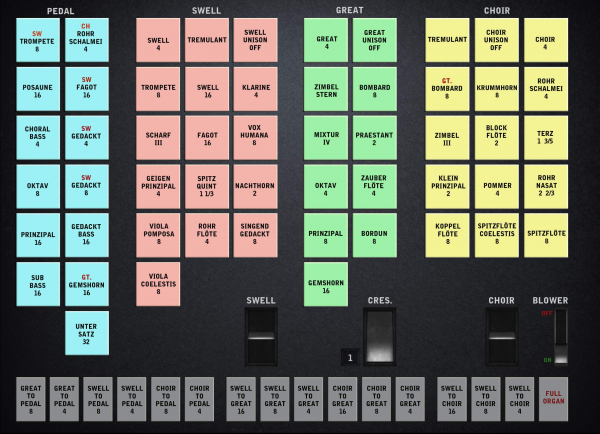 This stand-alone Choir Bombard can be activated via a dedicated switch on the Mixer tab of the sample set. 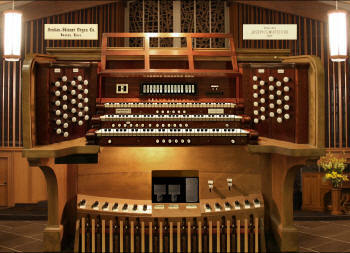 Its purpose is soloistic performance, it should never be used as a part of tutti (full organ). Sw/Ch 16', Sw/Ch 8', Sw/Ch 4'. See the updates tab for the third-party extensions (4 manuals, 75 speaking stops). 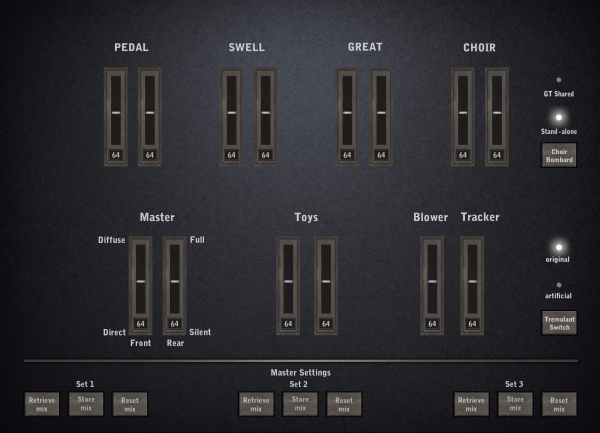 The MIDI continous controlles for the pedals (swells and crescendo) can be specified by right-clicking the movable pedals on the screen. All the other screen components are image-only. The switch in the right makes the selection for the tremulant between the sampled tremulant and artificial (Hauptwerk model) tremulant. 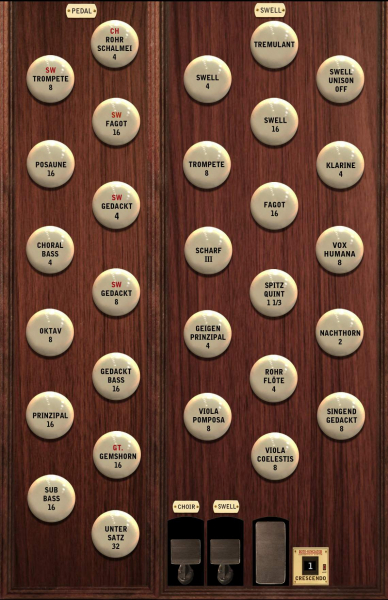 The switch in the upper right corner makes the selection of the Choir Bombarde possible. Either it is shared with the Great Bombarde - which is the original mode on the real instrument - or it is a stand alone rank (virtual extension). 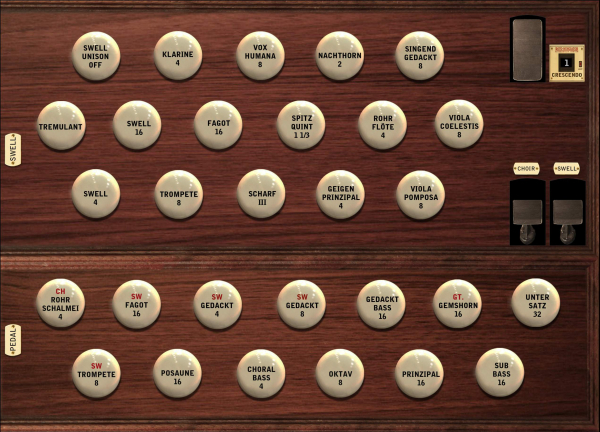 All the stops and other controls of the organ can be found here. Physical pistons or draw stops can be assigned to a virtual button on screen by right-clicking on the button. the crescendo sequence can be adjusted here. By clicking the gray/white box, the stop is enabled/disabled in the given screscendo stage. The crescendo settings is remembered by Hauptwerk via Hauptwerk dedicated combination system (each stage of the crescendo is a memory for the combination system). 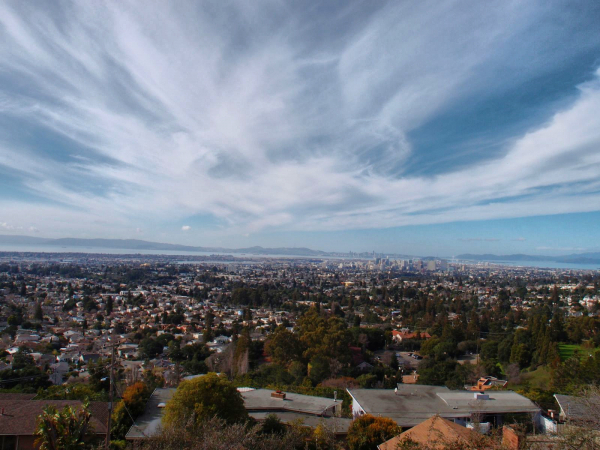 Jake from Custom Hauptwerk Organs has prepared an extension for the Oakland sample-set matching the style of Aeolian-Skinner. 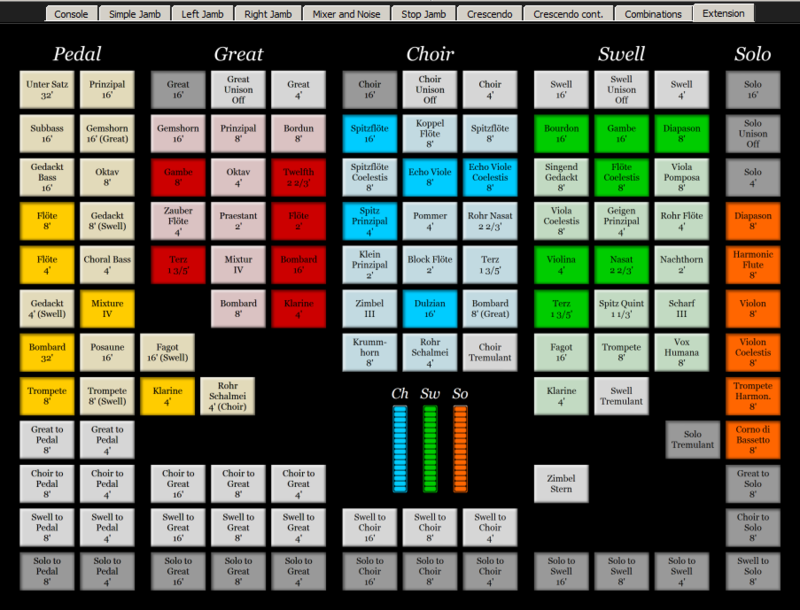 It features an extra 30 stops in addition to the stops offered in the original sample-set (4 manuals, 75 speaking stops in total). 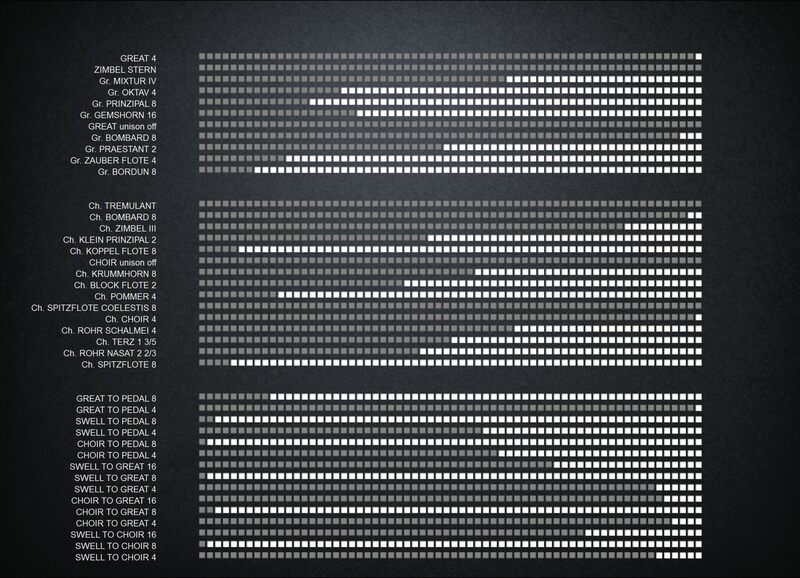 The extension includes a Solo division which can be assigned to a keyboard on four manual consoles, or used as a floating division on smaller consoles. 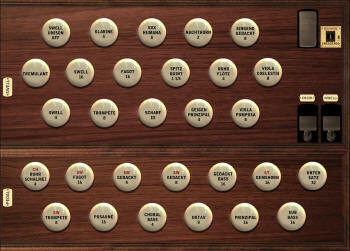 It is still possible to use the original organ when the extension is loaded. This extension is not a part of the sample set of Sonus Paradisi and it must be purchased separately from its creator. Please contact Jake at customhworgans[at]gmail[dot]com to order the extension. 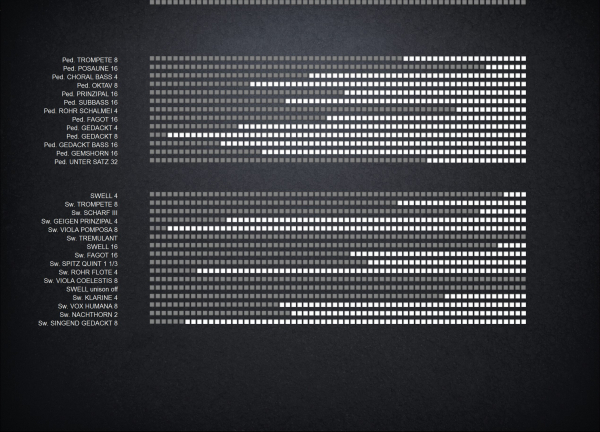 All the extra couplers, sub-couplers and super-couplers were added as well.